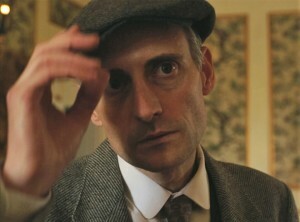 Just last week I became Hugh Blaker, the artist and art dealer who is famous for discovering the Isleworth Mona Lisa. It is for an art installation that will fly around the world displaying ‘The Other Mona Lisa’. The documentary was produced for the Mona Lisa Foundation and ably directed by Yan and Rafael Feldman who played the twins in the 2005 Sci-Fi film Serenity. What do you think? More than a passing resemblance. I think the eyes have it. What do you reckon?